It's day 1 of our trip to Puerto Rico! We are just settling in tonight, staying with a friend in Arroyo on the Southside of the island. After getting our rental car and buying some necessities, we headed to dinner to try some local food at an outdoor restaurant. 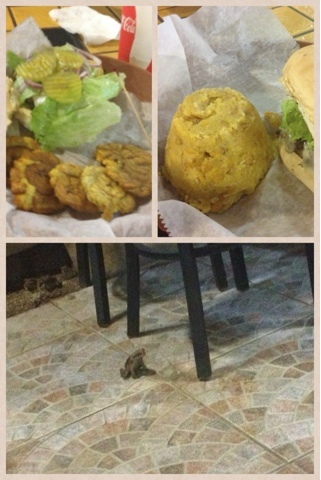 We had tostones (fried plantains) and mofongo (mashed plantains) - dined along side some friendly frogs and lizards! We really liked the food we tried - can't wait to try more local specialties! We start our adventure with zip lining in the rain forest tomorrow - more posts to come! Let the fun times begin! Hope you have a wonderful time. I bet the zip lining will be a blast. Right up there with the monkeys. Do they have monkeys?